Family Mass: Pope Francis arrives to the altar to celebrate the closing Mass of the World Meeting of Families in Philadelphia yesterday (September 27). 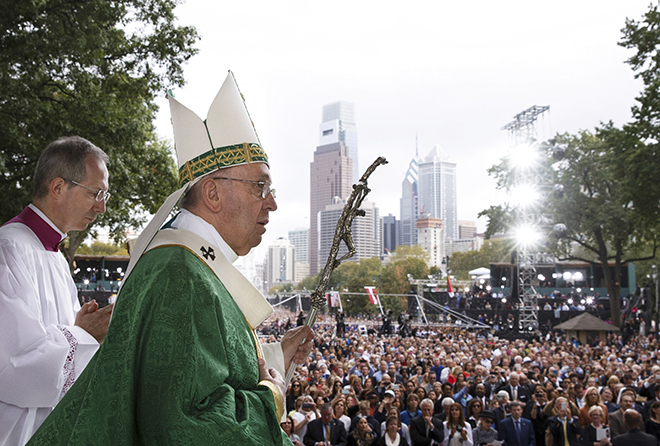 POPE Francis urged the hundreds of thousands of people gathered for the closing Mass of the World Meeting of Families in Philadelphia, United States, yesterday (September 27) to serve and care for each other as freely as God loved the human family. The Pope called upon the faithful to embrace signs that the Holy Spirit can work through everyone. He referred to the readings in the multilingual Mass – from the Book of Numbers and the Gospel of Mark – in which members of the faith community questioned the work of those not part of their group and for prophesying in the name of God. Illustrating his point before the Mass, Pope Francis engaged in “little gestures” himself along the papal parade route to the Mass, kissing and blessing many babies brought to him from the sidewalk throngs by Secret Service agents, who themselves managed to crack smiles after days of maintaining a stern demeanour as they guarded the pontiff. Pope Francis recalled that Jesus encountered “hostility from people who did not accept what he said and did”, saying they thought it intolerable that Christ was open to honest and sincere faith from men and women who were not part of God’s chosen people. “The disciples, for their part, acted in good faith. But the temptation to be scandalised by the freedom of God, who sends rain on the righteous and the unrighteous alike, bypassing bureaucracy, officialdom and inner circles, threatens the authenticity of faith. Hence it must be vigorously rejected,” he said. “Once we realise this, we can understand why Jesus’ words about causing ‘scandal’ are so harsh. For Jesus, the truly ‘intolerable’ scandal consists in everything that breaks down and destroys our trust in the working of the Spirit,” he said. Pope Francis asked the worshippers to consider how they shared God’s love with people in their families and in the world around them. “What kind of world do we want to leave to our children?” he asked, referencing a line in his encyclical “Laudato Si’, On Care for Our Common Home”. Calling the Church to renew faith in the word of God, the Pope said people can live prophetic lives as a “kind of miracle in today’s world”. Meanwhile, the Pope, visiting prisoners in Philadelphia, on Sunday (September 27), stressed that no one was perfect and without need of forgiveness. The Pope spent about an hour at the Curran-Fromhold Correctional Facility. He entered the gymnasium from behind a blue curtain, walking up on to the small stage and carefully inspecting the large chair the inmates had made for him. He turned, with a big smile across his face, and gave the inmates a sincere Pope Francis thumbs-up. As the US debates the need for penal reform, the Pope said prisons must focus on rehabilitation. While his speech was addressed primarily to the inmates, a small group of their family members, prison officials, state legislators and city officials, including Philadelphia Mayor Michael Nutter, also attended. Deacon Ed Dymek, who ministers at the prison, told Catholic News Service before Pope Fracnis arrived, “There’s pope hope”. Pope Francis addressed the inmates in Spanish, “not English because I do not speak it well”. However, he said, his aide, Monsignor Mark Miles, from the Vatican Secretariat of State, “does” speak well. The Pope also told the inmates he was visiting as a pastor, “but mostly as a brother”. Serving time in prison was a painful time, said the Pope, who continues to speak on the telephone with inmates he used to visit in Buenos Aires, Argentina. “Any society, any family, which cannot share or take seriously the pain of its children and views that pain as something normal or to be expected, is a society ‘condemned’ to remain a hostage to itself, prey to the very things which cause that pain,” he said. The Pope spoke to the inmates about Jesus washing his disciples’ feet, explaining that back in those days, people wore sandals and the roads were dusty. Everyone needed to have his or her feet cleaned. Often there were pebbles and stones, too, which hurt. Jesus, the Pope said, “doesn’t ask us where we have been, he doesn’t question us about what we have done”. Instead, Jesus washes peoples’ feet and gives them life. “The Lord goes in search of us; to all of us he stretches out a helping hand,” the Pope said. “It is painful when we see prison systems which are not concerned to care for wounds, to soothe pain, to offer new possibilities. “It is painful when we see people who think that only others need to be cleansed, purified, and do not recognise that their weariness, pain and wounds are also the weariness, pain and wounds of society,” Pope Francis said. The Pope urged the prisoners to dedicate their time in prison to “getting back on the right road”” and preparing to rejoin society. Dechon Adams, who was charged with a weapons offence, called it “beautiful” that the Pope took the time to greet each prisoner – 11 women and almost 60 men – and offer his blessing. Mr Adams, who identified himself as Christian, agreed with Pope Francis’ explanation of Jesus’’ washing the disciples’ feet. “We all need cleansing,” he said.